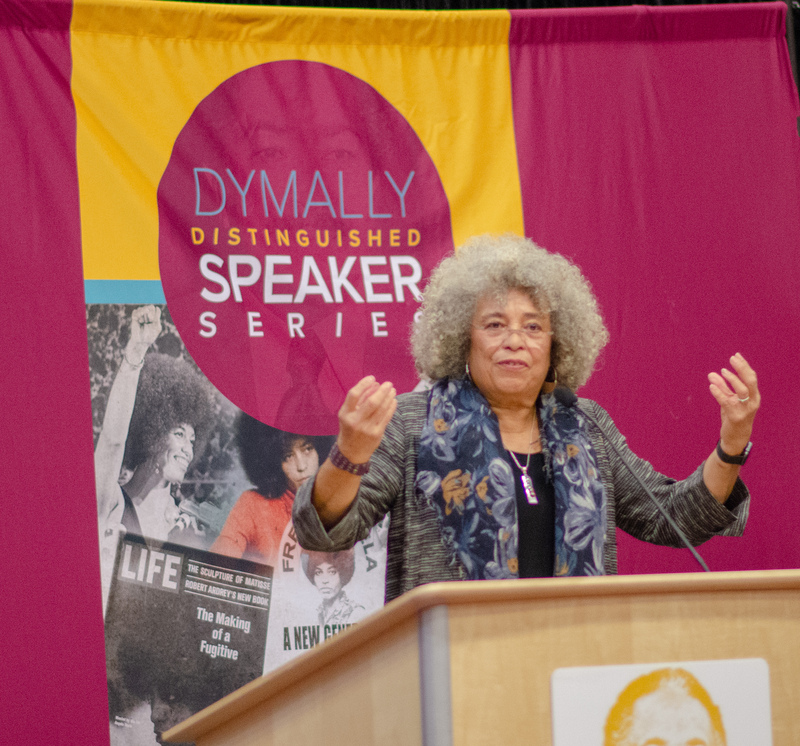 Thunderous cheering reverberated through the California State University, Dominguez Hills gymnasum Monday night, as one of the most outspoken activists of her generation, Dr. Angela Y. Davis, made her way to the podium as part of the Dymally Distinguished Speaker Series celebrating Black History Month. Prior to her arrival, gymnasium bleachers and foldable chairs in the middle of the court filled quickly as Voices for a New Generation took the stage to vocalize the struggles and strengths of their community through poetry and spoken word. Profound verses from the black members of Toro Spoken Word caused spectators to cheer from the stands, evidently empathetic to their experiences. By the time Davis took the podium, every seat was full, and groups chose to sit on the floor or stand in the perimeter of the gymnasium to listen to the world-renowned activist, educator and scholar. Davis initiated her speech recollecting memories of a time when blacks did not yet have a month to reflect on black issues. They didn’t have one, she said, because they weren’t given one. So, they took it. She unapologetically challenged the ignorance of those who use Black History Month as an opportunity to argue for “White History” as if white history had not always prevailed in schools, media, and all institutionalized learning facilities. As faces of all colors in the crowd gave her their rapt attention, Davis assured them Black History Month was not solely for the celebration of African-Americans, but also, for anyone who is an ally and empathizes with the victims of what she characterized as a flawed U.S. democracy that applies only to white men. The crowd applauded as Davis commemorated the determined resistance against oppression given the longevity of black struggles, saying though some have given up by now, the majority continue to pass the baton of strength along the next generation. During her speech, Davis also tackled issues of Islamophobia and called for solidarity for Palestinians and members of the North and Central American caravan who deserve justice. She said we need to recognize how our struggles here in the United States are linked to conflicts all over the world. Davis also urged the crowd not to assume feminism is only about women or privileged white women, calling it plural due to the nature of intersectionality. However, she focused on the type of feminism most helpful to the struggles for equality: abolition feminism. To end her empowering speech, Davis left the crowd to question not how, but rather what kind of society would no longer thrive on systematic violence against women, minorities, animals and the environment.